Chronic obstructive pulmonary disease (COPD) is among the major health burdens in adults. While cigarette smoking is the leading risk factor, a growing number of genetic variations have been discovered to influence disease susceptibility. Epigenetic modifications may mediate the response of the genome to smoking and regulate gene expression. Chromosome 19q13.2 region is associated with both smoking and COPD, yet its functional role is unclear. Our study aimed to determine whether rs7937 (RAB4B, EGLN2), a top genetic variant in 19q13.2 region identified in genome-wide association studies of COPD, is associated with differential DNA methylation in blood (N=1490) and gene expression in blood (N=721) and lungs (N=1087). We combined genetic and epigenetic data from the Rotterdam Study (RS) to perform the epigenome-wide association analysis of rs7937. Further, we used genetic and transcriptomic data from blood (RS) and from lung tissue (Lung expression quantitative trait loci mapping study), to perform the transcriptome-wide association study of rs7937. Rs7937 was significantly (FDR < 0.05) and consistently associated with differential DNA methylation in blood at 4 CpG sites in cis, independent of smoking. One methylation site (cg11298343-EGLN2) was also associated with COPD (P=0.001). Additionally, rs7937 was associated with gene expression levels in blood in cis (EGLN2), 42% mediated through cg11298343, and in lung tissue, in cis and trans (NUMBL, EGLN2, DNMT3A, LOC101929709 and PAK2). 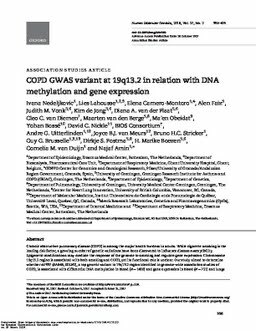 Our results suggest that changes of DNA methylation and gene expression may be intermediate steps between genetic variants and COPD, but further causal studies in lung tissue should confirm this hypothesis.